ompared to the traditional thermal receipt printer, This Mini printer has a small size, light weight, reliable performance, simple connection, easy to use. The main scope of application are: It has been widely used in Mobile police system, Tobacco distribution, utility watermeter reading system, Mobile office / Mobile Logistics system, Portable Instrumentation / Testing equipment, Taxi Bill printing, Restaurant ordering information printing, Online Payment information printing. Low operating costs (no ribbon, cartridge).The specification of the paper :Type: Roll Paper. Width :57.5±0.5mm. Roll Diameter: 50mm . Paper Thickness: 0.06-0.08mm. 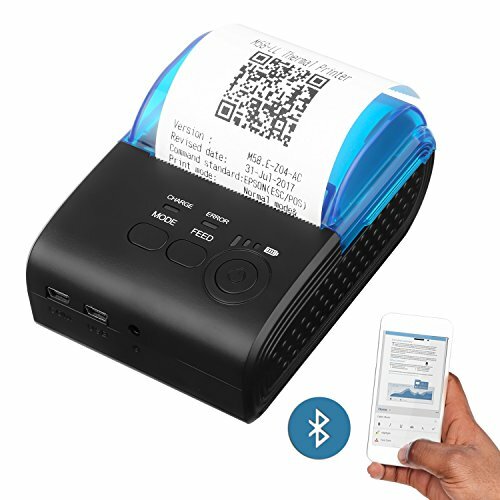 Built-in rechargeable 1500 mAh lithium ion, standby time can reach 5-6 days Convenience printer: Direct thermal printers use heat instead of ink and are typically smaller,quieter,faster,and more energy-efficient than dot-matrix printers. It applies mobile products to supporting the use, and suited to outdoor work environments. If you have any questions about this product by PowCube, contact us by completing and submitting the form below. If you are looking for a specif part number, please include it with your message.